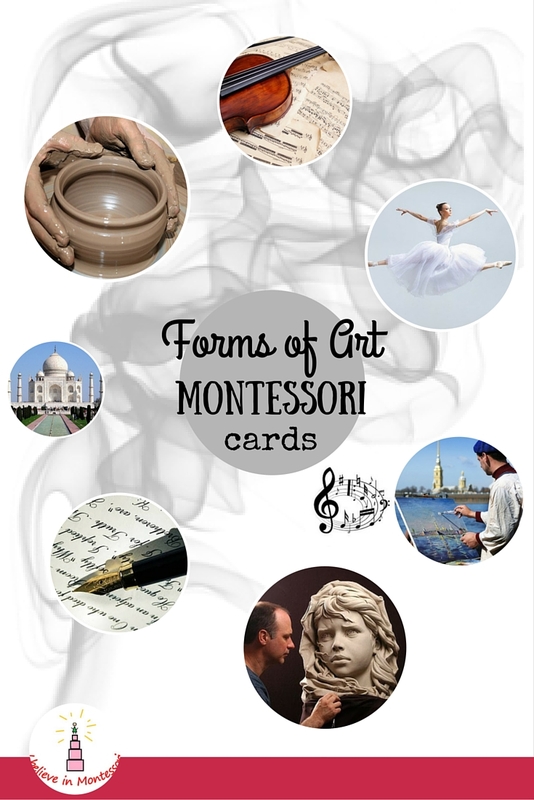 We are learning more and more about Montessori Art appreciation. 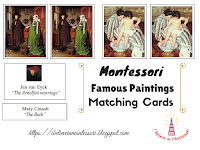 In the last post, we were learning about artists himself using Famous Artists 3-part cards, so the next level is learning one of the most famous paintings of each artist. 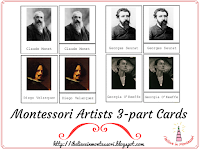 This material is different from matching famous painting because its aim is not exactly to match but to make a connection in Child's mind between artist and painting. I made this material in a form of a bingo game. Here you need to match colorful pictures to black and white ones. I made the material in the way that one card contains only one artist. I made it specifically to separate all of them. So when many cards are presented each artist is independent and to my mind the Child is more likely to remember them this way. This will help the Child to be concentrated on the couple artist+painting more. 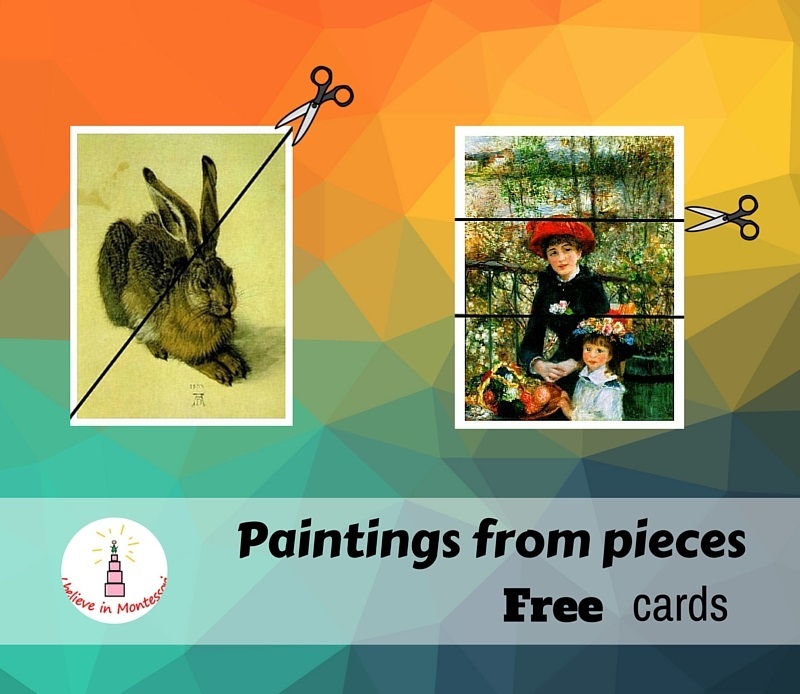 The background of cards has a look of a wall and every picture is in the gorgeous frame creating the feeling of them hanging in the art gallery. Material depicts such wonderful artists as Georges Seurat, Francisco Goya, Jan van Eyck, Pierre Renoir, Vincent van Gogh and others! 1. Tell the Child that today you are going to look at the artists and their wonderful paintings. 2. Take several cards and put them in a column. 3. 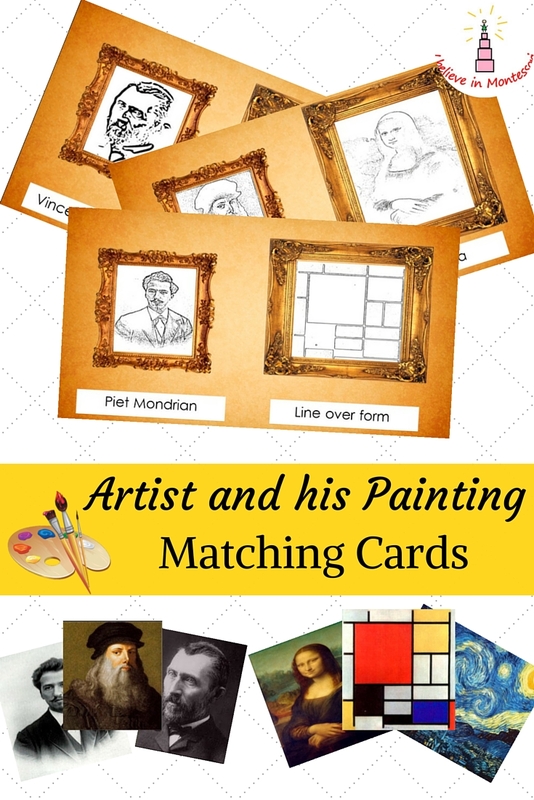 Take artists cards and match them to black and white ones. 4. 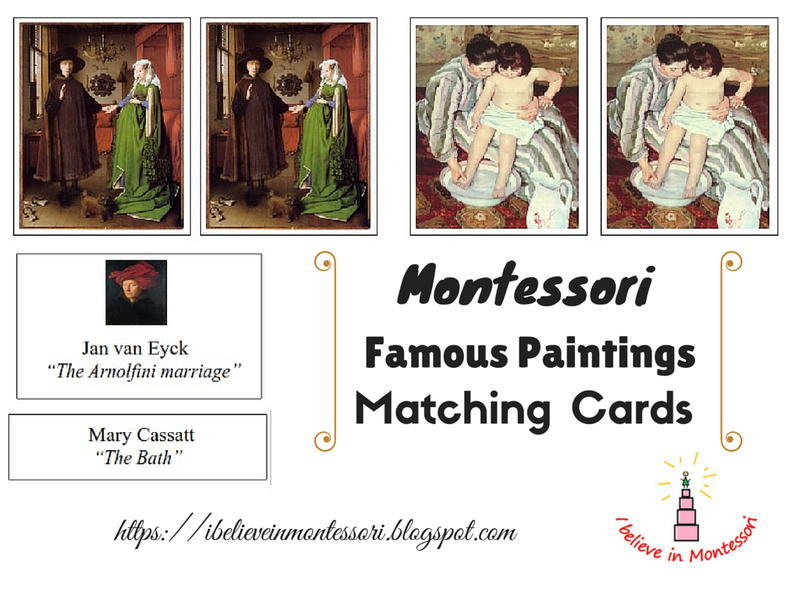 Take paintings cards and match them to black and white ones. 5. Take name cards and match them too. 6. Tell "Look, we matched all the cards. Do you like this work?" You can start with matching just a few cards or even one. When Child feels confident in a matching activity you can make it a bit more difficult and let him match names without help from the card. 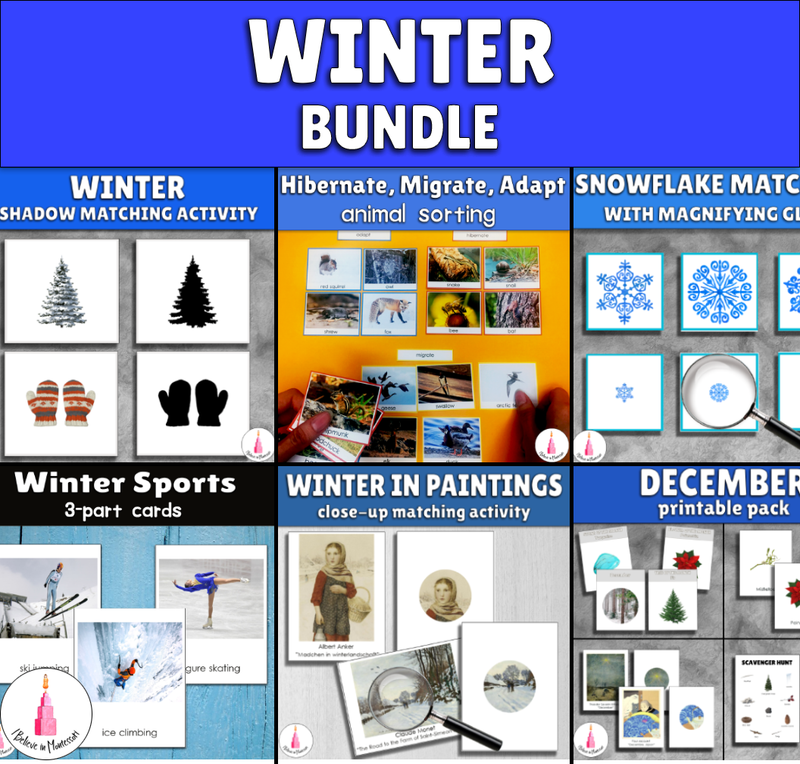 Just use blank labels and cover the names and let the Child choose the right ones. The uncover the names and let the Child control himself. 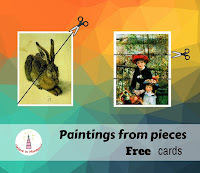 If Child is successful in this activity try then removing bingo-like cards and just match artists to the paintings. There are only a few levels left until the end. See you next time!